Whether you are interested in competing or looking to stay healthy and learn some self-defence, our adult classes are tailored to suit your needs. 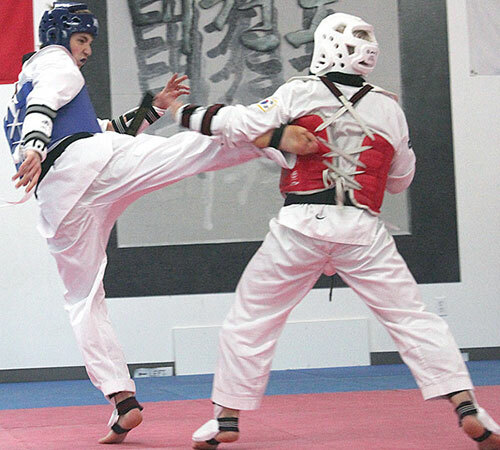 Taekwondo classes combine the superb training of learning patterns (known as Poomsae in Korean) together with the more physical aspect of sparring. Patterns are a series of fundamental movements set into a logical and fixed sequence based on a variety of defensive moves. Learning patterns enables students to develop motor skill, an increased ability to focus, and balance. Sparring allows you to learn how to use your feet and your hands to perform a series of manouevers when sparring with an opponent. No one is forced to compete - you can join in fun in-class sparring, or you can compete at tournaments - the choice is up to you! Our adult class is a fun way for anyone- regardless of age or fitness level - to get into great shape and learn the art of Taekwondo. Students progress at their own pace, while losing fat, toning/strengthening muscles, increasing cardiovascular health, and increasing flexibility.